Motivating our son to walk hasn't been that easy because he is a little protester. His lack of motivation to get mobile is stronger than the hypotonia. Back in September, he did an amazing progress in his gross motor skills, but he slowed down around December. I took it easy this time and we gave him a break again. It is working as it happened back in September. His gross motor skills have improved in the last 5 weeks. He is riding his walking bike without protesting and he is pushing a push toy our PT borrowed. He is walking one hand supported; he is standing up and walking by putting his hands against a flat surface. He learned on his own to ride on and off his bouncing zebra. He is standing with his hands free when he is playing with his fridge toy or when he is in the crib. For our surprise, he did his first-three independent steps. My husband was so excited and he started to scream, but Tommy felt and hit his head before I could get to the living room. I missed it! Hopefully, I will see it next time. Video of Tommy walking with his push toy. Rocking. His body is getting stronger. He is getting a nice straight posture, but I still think we have to work more to strength his torso. Tommy loves the song Row, Row your boat. I am using this song to strength his abdominal muscles while he is rocking. I slowly push him back until he has to hold himself. We do it back and forth until I finish to sign and I start over again. He thinks it is funny! Pony Ride. I remember when I was a child, I used to like pony rides. We started it with Tommy last week it. It is a fun way to improvs his gross motor skills and balance. According to the book The Parents Guide to Play, "as you crawl and wiggle your way through the house, your child is learning how to find and keep her center of gravity. She or he will also be stretching her imagination by pretending she or he is riding a pretty pony –or perhaps a dashing steed. "Tommy is defiantly using his imagination because he bounces on us. Climbing. We are encourage Tommy to climb as much as he can going up and down the stairs. He needs more practice going down the stairs, but he is getting the idea. Climbing improves balance and gross motor skills while strength lower-body and creates spatial awareness. Aqua Therapy. Tommy is doing great in the Aqua therapy. His therapist thinks he is very smart because he gets everything very quickly. It is matter of time for him to transfer all the skills he is getting in the pool to his daily activities. Slide. Our neighbor has borrowed his kids' slide a couple of time. Tommy likes the slide. He keeps himself upright until the end of the slide, which means his torso is getting stronger. 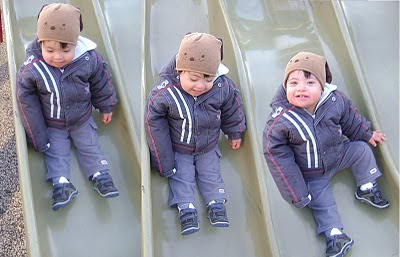 Today, we took him to the park to use the slide because it wasn't too cold. Toy Box. We are using the toy box as other tool to keep Tommy standing and cruising. While he takes his toys out of the toy box, he is working out his back and abdominal muscles. Trampoline. We haven't try it yet, but our PT and Lianna, the writer of the blog My Live with Gabriel, have suggested a trampoline with a bar to help Tommy to improve his gross motor skills. Lianna sent to me the following link to get an idea of how to look for a trampoline: http://www.kiddietoys.com/trampolines-c-119_177.html. We want to get a trampoline for Tommy because we know he will have fun while he is improving his gross motor skills without having the pressure of the therapy. He likes to "jump". What we do is to hold him by his torso. We count 1-2-3 and say Jump. Then, he pushes himself up and I light him up. He is getting too heavy for me. Therefore, a trampoline is becoming a need for our play therapy. We are very excited that he is getting closer to walk. His Physical Therapy said Tommy is figuring things out. He is not depending so much on us to improve his gross motor skills. We know that Tommy will be walking sooner than later because he is getting in the latest stage to start walking independently. lots of great ideas! thanks gurl! maya is just not motivated to walk for some reason. i am willing to try anything! thanks for all the ideas! maya is just not that into walking...i will try anything to get her going. I am going to reply to your email. Hi Rosa! Thanks for your comment on my blog. We do have a microphone that Matthew likes to babble into. We got it from Target and it doesn't require batteries. His voice echoes as he talks into it. Quite a fun toy. I, too, subscribed to your tools to improve gross motor skills except for the trampoline. We are waiting to get Matthew's spinal x-ray to check for atlanto-axial instability before we get a trampoline.